The Mayor’s Office of Economic Development and the Maui Chamber of Commerce honored the nominees and winners of the 2017 Mayor’s Small Business Awards on Tuesday, March 7, at the King Kamehameha Golf Club. 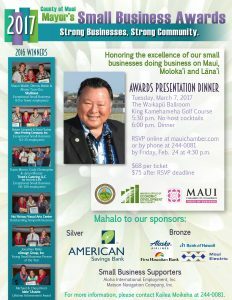 The awards were presented in five categories by Mayor Alan Arakawa and Maui Chamber of Commerce President Pamela Tumpap. 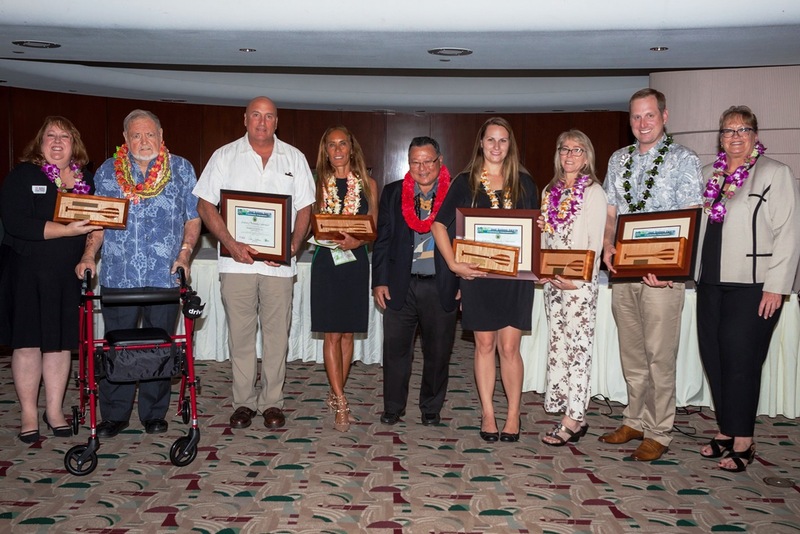 The awards dinner was held in partnership with the Maui Chamber of Commerce, and sponsored by silver sponsors American Savings Bank and HMSA; and bronze sponsors Alaska Airlines, Bank of Hawai‘i, Employers Options, First Hawaiian Bank and Maui Electric Company. Applications were scored by judges Paul Felix, Debbie Finkiewicz, Susie Thieman, Brian Thomas and Wayne Wong. Artistic Builders Corporation is a full-service general contracting company with over 40 years of construction experience in residential and commercial construction and renovation and tenant improvements. In 2008, after completing college, Brian heard from his mother that ABC (started by his father in 1997) was insolvent due to the Great Recession. Not willing to let this happen, Brian returned home to take control of the company. 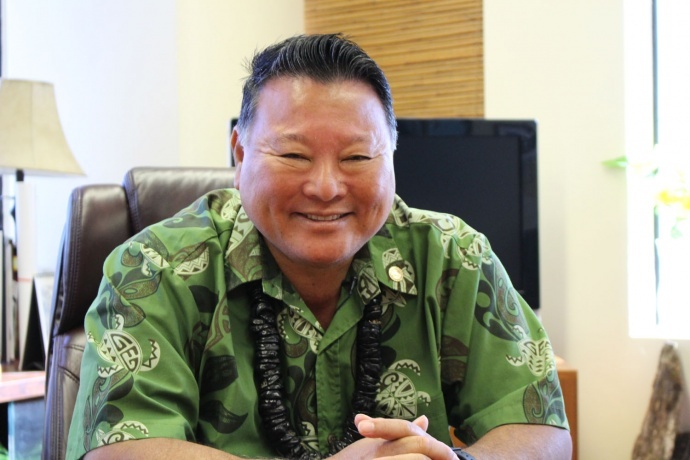 By restructuring the company, its employees, capital structure, vision, bonding capacity, and by improving the company’s track record, Brian was able to turn ABC around, as demonstrated by their placement on Hawai‘i’s 50 Fastest Growing Companies. They were in 49th place by 2013 and made 8th place by 2016. From 2013 to 2015, they grew from six to 12 full-time employees and employ 20-30 subcontractors, providing many with high-paying jobs and good benefits. However, that doesn’t tell the whole story. Through the projects that ABC wins, the downstream impact of increased jobs is exponentially larger in comparison to the six jobs that were grown over the last two years and these projects have had a huge impact on other industries such as telecom, insurance, retail, and medical. Founded in 1955, Ka Lima O Maui is a private nonprofit with the mission of “Enhancing Lives through Self-Reliance” for persons with disabilities. They accomplish this through job skills training, employment in contract janitorial and landscape jobs, placement in a variety of integrated community positions and adult day health services. They serve approximately 200 individuals with disabilities each year and help them become contributing members of the community, reducing their dependence on government subsidies. Ka Lima O Maui hired 60 persons with disabilities and 89 total in 2016. Headed by Chantal Ratte, who has been with the organization for 23 years, this nonprofit was selected as one of Hawai‘i’s Best Places to Work in 2009 by Hawai‘i Business Magazine. The agency is Maui’s largest employer of persons with disabilities and has been named Employer of the Year by Maui’s local Division of Vocational Rehabilitation Services branch. Finally, the agency works closely with the different Maui high schools and their Special Education transition programs. 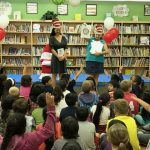 Every Spring Ka Lima O Maui visits special education classes to encourage graduation students to enter the workforce and offers assistance to make it happen. Windward Aviation has served Hawai‘i since 1990, providing critical services to numerous county, state and federal agencies, as well as utility providers, nonprofit organizations and private businesses. Owners Don and Donna Shearer have grown the specialized aviation company into one of the most trusted public and private service providers in the state. Their aviation services touch nearly everyone in Hawai‘i as they assist with fighting fires, search and rescue operations, transporting passengers and gear to job sites, filling golf course sand traps and pouring cement, spraying agricultural areas, eradicating marijuana and invasive species, pulling telephone and electrical wires, moving hazardous materials, and aerial filming for movies, surf competitions and commercials. Their team is highly trained and they have received many accolades, including: the Exemplary Act Award from the U.S. Department of the Interior for Don’s rescue of two Paramount Pictures employees in 1992 when their aircraft crashed into the Pu‘u Oo Vent of Kīlauea Volcano. The three-day rescue mission was one of the most intensive ever on Hawai‘i Island. In addition, the company is a long-time supporter of Maui’s communities, hosting school groups to enhance aviation education, sponsoring school fundraiser events and providing dedicated flight time to nonprofit agencies, including hosting flights for children through the Make-A-Wish Foundation. Andrew Keenan, a licensed contractor on Maui for 13 years, saw limited supplier options for windows and doors on Maui. 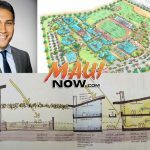 He opened Maui Windows & Doors in 2014 with a 3,000 sq. ft. modern showroom featuring dozens of top window and door brands and full-sized displays. It is a place for contractors to meet with clients and see products in person. Andrew involves his employees in community activities and his Vice President, Trisha Egge, is a CIM Board Member who helped bring back the Maui Home Show in 2016 and regularly hosts CIM events. He also invests heavily in staff training to ensure expert information is provided to clients, and he provides employees with profit-sharing of 10% of all profits, distributed quarterly. In addition, Andrew teaches the “Becoming a General Contractor” class at UH-Maui College. This class is designed to take local tradesmen and women and teach them how to get a contractor’s license, build a company and manage projects. The class is very important to Andrew and is designed to bridge the gap between being an employee and owning a business. The class has been going for three semesters, with approximately 70 students to date, several of whom have gotten their licenses and many that Andrew mentors on a regular basis. Ceramic Tile Plus and Exclusively Yours are the family-owned businesses of James Doran Jr., who has served Maui for nearly 40 years. He was the first to bring prefabricated granite countertops to Hawai‘i. Since its founding, CTP has grown to feature the largest selection of natural stone, porcelain, decorative tile and raw slab materials on the island. In 2008, James purchased the old Cutter Car Dealership in Kahului to bring all his operations under one roof. From two employees, CTP and EY have grown to a combined 35 employees— the lifeblood of the company dedicated to bringing their clients’ dreams to reality. This year the CTP team is being recognized as one of “The Best Places to Work in Hawai‘i” by Hawai‘i Business Magazine. They will be honored on March 30, in Honolulu. Ingrained in each employee is the belief that the measure of a company is more than how to handle projects for the clients when things go perfectly. One of their other core values is giving back. CTP consistently gives to numerous nonprofits and youth programs each year, including Habitat for Humanity, Maui Food Bank and Ka Lima O Maui to name a few. He also reserves the store parking lot every Saturday to allow youth groups and other nonprofit organizations to hold fundraising car washes there free of charge. For more information on awards, grants and programs managed by the Mayor’s Office of Economic Development, visit here.